IT WAS approximately the year 960 BC. King Solomon had just overseen the completion of the construction of the Temple at Jerusalem and the people held a glorious dedication celebration. King Solomon prayed and consecrated the temple and the courtyard. Scores of sacrifices were offered and there was great rejoicing. Fast forward to the year 2006, Nov 12. That Sunday evening, a 850-strong congregation from Telok Ayer Chinese Methodist Church (TACMC) gathered in Telok Ayer Second Sanctuary (TA2) to dedicate the church building to the Lord. Two years after the completion of the building at TA2, all loans were fully repaid. It is for this reason that TACMC members and guests, including Bishop Dr Robert Solomon, Chinese Annual Confderenc President the Rev Khoo Cheng Hoot and the two District Superintendents, the Rev Chua Ooi Suah and the Rev Chong Chin Chung, gathered to give thanks and to offer the building in dedication to God. The air of solemnity, the grandeur, the sense of anticipation, the presence of musicians playing the organ, piano, violin, trumpet, flute and timpani coupled with choir members dressed in flowing blue and red robes and the clergy clothed in robes of stately black – all these were reminiscent of the days of King Solomon. The Dedication Service commenced promptly at 5 pm. In his address, the Rev Khoo commended the unity displayed by members. 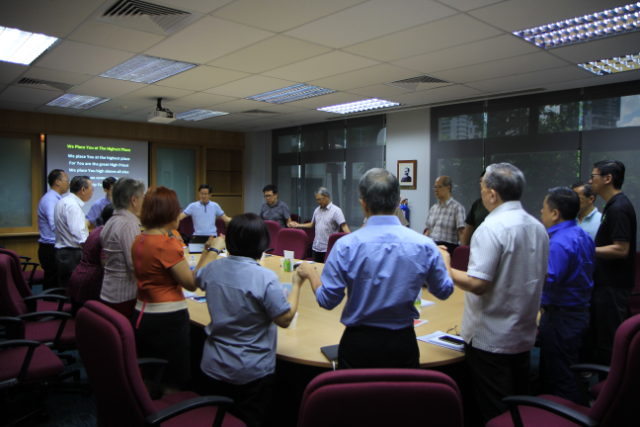 The service continued with Mr David Tay Boon Hua, the Associate Lay Leader, presenting a slideshow report on TA2, which showcased the historical milestones of TA2, formerly known as Telok Blangah Chapel. Thereafter, eight lay officials, on behalf of TACMC, presented TA2 to Bishop Dr Solomon for its dedication. 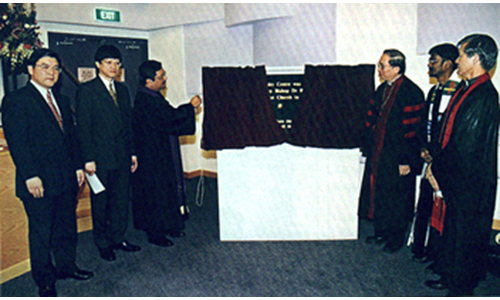 The Dedication Plaque was then unveiled by the Bishop and witnessed by the Rev Khoo, the Rev Chua, the Rev Chong, TACMC’s Pastor-in-Charge, the Rev See Ping Eik, and other TACMC pastors and lay officials. The congregation also witnessed the consecration of the baptismal font, the pulpit, the lectern and the Lord’s Table. In his sermon “The Great Commission Church”, Bishop Dr Solomon reminded the church that the Great Commission must be the reason for every church’s existence. The Great Commission not only meant producing converts, but also the making of disciples. And how does the church achieve this task? 3. Through the Eucharist – where Jesus meets His disciples at the communion table. for the pulpit, the baptismal font and the Lord’s Table. When we as the church dedicate these items, we are not simply dedicating articles of furniture or brick and mortar. We are dedicating ourselves. Hence, when visitors come to the church, they do not simply admire the architecture – they admire the community. Indeed, the unity of the community was seen when the congregation took part in the holy communion administered by the Bishop and assisted by the pastoral team. Observing the joyful faces on congregation members, it was clear that the Dedication Service was a moving experience for many. The service ended at 7 pm with an anthem beautifully rendered by the combined Hokkien, Mandarin and English Choir. I believe what members brought back after the service was this reminder: That the church was not built for man’s glory like the Tower of Babel but for God’s glory so that, as proclaimed by King Solomon, “ … all the peoples of the earth may know that the Lord is God and that there is no other” (1 Kings 8: 60). The celebration continued with a dinner held at Dragon Gate Restaurant. More than 1,000 people attended, filling up 110 tables. Given TACMC’s long heritage, it was apt to invite an Honorary Steward, Mr Richard Tay Tong Thiam, who is one of the longest-serving members of TACMC, to start the dinner with an opening prayer. Throughout the happy event, the atmosphere was lively. Many could be seen enjoying the meal. Others were milling around looking for familiar faces and some were chatting intently. At the start of the eight-course dinner, the TACMC Youth Choir rendered two songs in a cappella. These songs had been earlier composed by a Youth Choir member, Lin Song En. Midway through, in appreciation of their officiating the TA2 dedication, the Rev See presented gifts to Bishop Dr Solomon, the Rev Khoo and the District Superintendents. Following this, the Rev Chng Siew Sin, the Associate Pastor, led three toasts of thanksgiving, glorifying and blessing in honour of God. By 9.45 pm, the last dishes were served and the dinner concluded as guests left in groups with cheery faces engaged in merry chatter and their families in tow. 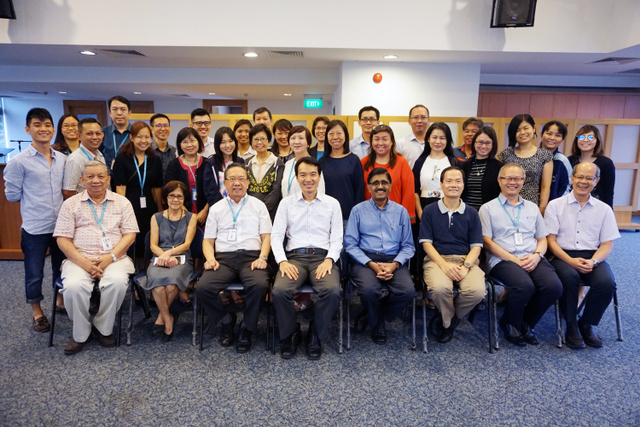 Dr Tan Chew Lim is the Lay Leader of Telok Ayer Chinese Methodist Church.